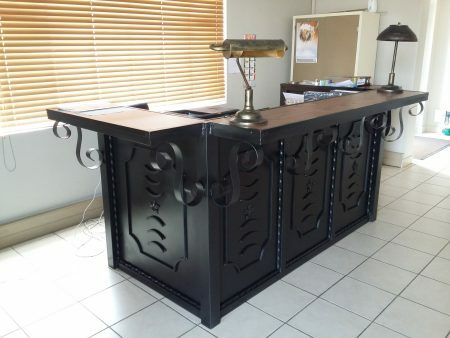 This eye-catching wrought iron/wooden top reception desk is located at our own premises for scrutiny and inspection. 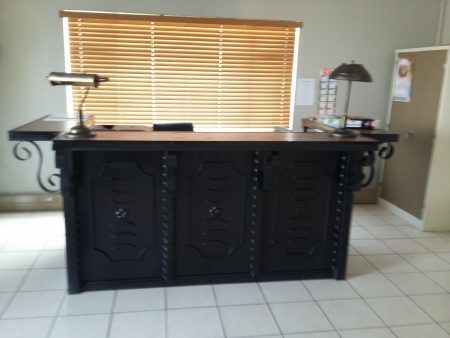 The wooden working surface of the desk measures 1850mm x 950mm and is 750mm high whilst the upper shelving portion measures 2 x 380mm wide x 980mm long and 1 x 330mm wide x 1950mm long. 4 Main uprights 76mm x 76mm square tubing, the intermediate uprights, bottom ties and shelving supports 50mm x 50mm square tubing. The closure sections are manufactured from 1.6mm sheeting decorated with twisted and regular 12mm square bar with floral castings and the scrolls are made from 50mm x 2mm flat bar. All the components have been stylishly assembled and finished in a pre-primed matt black coating.